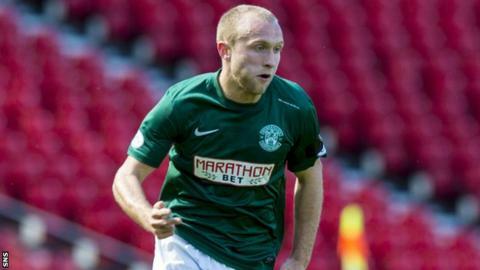 Hibernian have signed midfielder Dylan McGeouch from Celtic on a three-year deal for an undisclosed fee. McGeouch, 22, made 26 appearances for Hibs last season while on loan. "I'm really pleased to join Hibs permanently and pick up from where I left off last season," he told the Hibs website. "I really enjoyed playing for the club and working with Alan Stubbs, so when the opportunity came up to come back to Hibs it was the right choice for me." It is another piece of business between the Easter Road club and Celtic, with playmaker Scott Allan having moved west in a permanent switch and Liam Henderson having moved to Leith on loan. McGeouch added: "At this stage in my career, I need to be playing games on a regular basis and I felt I really benefited from that experience last season." Stubbs, Hibs' head coach, said: "He was one of our stand-out performers last season and he is a player that I've wanted to sign on a permanent basis from the very first day he joined on loan. "So the fact that we're now in a position to make that move a reality is fantastic news for everybody connected to the club." Meanwhile, Hibs have loaned out winger Alex Harris to Championship rivals Queen of the South. The 20-year-old has started 28 games for the Edinburgh side and was with Dundee on loan for the second half of last season, featuring in 16 games. "It's important that Alex continues his development by playing regular first team football and unfortunately we couldn't offer him that here," said Stubbs.